It's just a matter of taking out your phone from your pocket and shooting pictures and videos when you want to memorize some special moments and beautiful scenery. However, do you know that along with the photos you saved on your Android phone, the corresponding photo caches will also be generated and stored on your device. And generally speaking, such files can do nothing to your device except taking up the precious storage space. So you have every valid reason to delete photo caches on Android so as to free up more space. 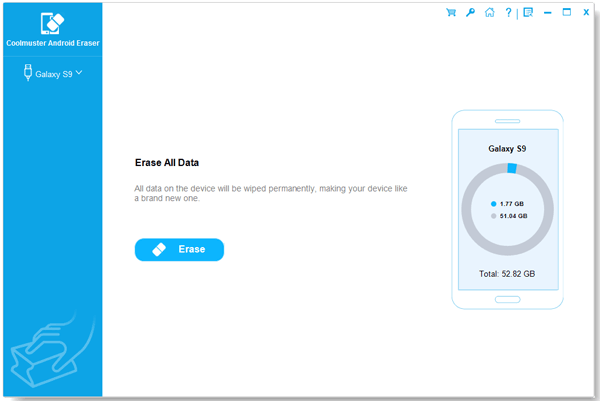 To do that, you just need to fully rely on this Android Data Cleaner software, which allows you to easily clear photo caches from Android within simple clicks. Moreover, aside from photo caches, you can also use it to delete other useless files like app crash logs, download temp files and many more from all Android devices without any hassle. Want your Android phone to operate a little faster? Just use this software and follow the below tutorial! First of all, open the installed software on the computer and then get your Android phone connected to the computer via the USB cord. This software will then detect your device and scan for all files. After choosing the right erasing mode and erasing level, this software will scan for all files and display them on the main interface as pictured in the below. All the file folders will be arranged on the left panel. Now, you just need to enter the right tab to preview more detailed file information and then select the wanted files by ticking them out. Finally, hit the Erase option to clear photo caches from Android! Within a little while, all the useless photo caches will be deleted on Android! So now why not give it a try by yourself?